Leicester Tigers eased into the final four of the Champions Cup thanks to a six-try 41-13 victory over Stade Francais at Welford Road on Sunday. 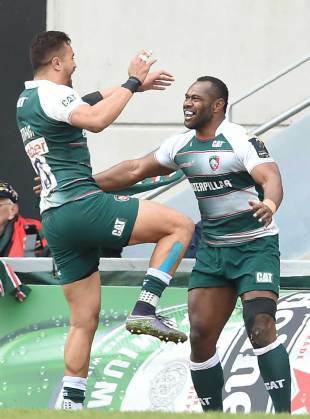 Vereniki Goneva (two), Manu Tuilagi, Freddie Burns, Mike Fitzgerald and Telusa Veainu all crossed as Leicester racked up six scores in securing comfortable passage to the European Champions Cup semi-finals. The Tigers will now meet the winners of Toulon and Racing 92 in their first top-tier European semi-final since 2009. Richard Cockerill's Leicester will have to raise their level considerably to extend their quest still further for their first European crown since 2002, such was Stade's malaise in the East Midlands. Should Toulon see off Racing this afternoon then Leicester would face a trip to Nice to take on the Champions Cup holders on Sunday, April 24. But if Parisians Racing win out in the last quarter-final, then Leicester would look forward to home country advantage, hosting the tie at Nottingham Forest's City Ground. England battering ram Tuilagi was again deployed at inside centre in his battle to master the 12 berth, but this clash was far too staccato to make any lasting judgements on his suitability for that new role. Fly-half Burns suffered a calf injury, but Leicester were otherwise largely untroubled, Stade simply not up to scratch. A curiously free-form game was ushered in the minute Djibril Camara misread the bounce on Burns' grubber - and even that followed a cute interception from Peter Betham. As Camara was bundled into touch, Tigers fly-half Burns was first to both feet and ball and fired a quick line-out to Tuilagi. The inexcusably static Stade defence could do nothing to stop the England centre coasting in for perhaps the easiest score of his career. Morne Steyn landed two penalties to Burns' one as both sides ground through a scrappy middle-third to the half. Finally Leicester stopped conceding needless penalties and sharpened up their attack, sufficiently enough at least to free Goneva for the second score. Harry Thacker linked well with Burns to fashion an unlikely midfield opening, only for prop Dan Cole to stem the move unwittingly by joining the line at the wrong time. The move ought to have died there and then, but Betham's blindside switch reignited the attack. The Australian centre caught Stade cold again, feeding Goneva to send the Fijian winger home amid woeful defence from the Parisians. The visitors had three defenders in place to cover Leicester's two-man strike but lost their bearings thanks to Betham's guile. Before the break Leicester had time to strike again, with Burns intercepting a poor pass from Steyn to coast under the posts. Leicester took a 24-6 lead into the break without ever finding fluency. Former Leicester scrum-half Julien Dupuy nipped in for Stade's sole try to start the second half, but any thoughts of a recovery were quickly extinguished. Captain Mathew Tait's break set the Tigers back on the prowl, before Ben Youngs exploited a woefully-open blindside to send Goneva tearing away for his second score of the afternoon. Owen Williams replaced Burns at fly-half just ahead of the hour, quickly striking a post with a penalty - that ultimately led to Leicester's fifth try. Tait countered Stade's clearance with pace, allowing Brendan O'Connor and Veainu to combine well on the right. Marcos Ayerza's astute tap-pass opened space on the left and Goneva sent flanker Fitzgerald home rather than chase his hat-trick. Veainu ghosted in all too easily for Tigers' sixth score, swan diving home untroubled.